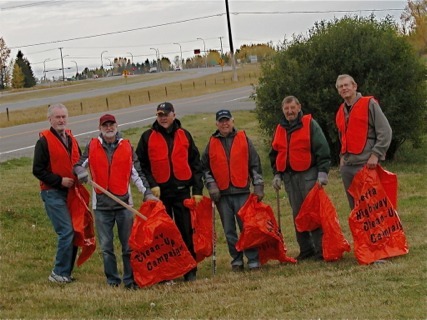 At least twice during the year, Mountainview members brave the interesting Calgary weather to decrease the litter along Highway 1A. It takes a dedicated group of Lions to spend a Saturday morning filling garbage bags with refuse so that the rest of the public can drive the highway without the benefit of garbage along the side of the road. Lion Jim McPherson Sr. organizes this service as an Associate Member of the Mountainview Lions Club. 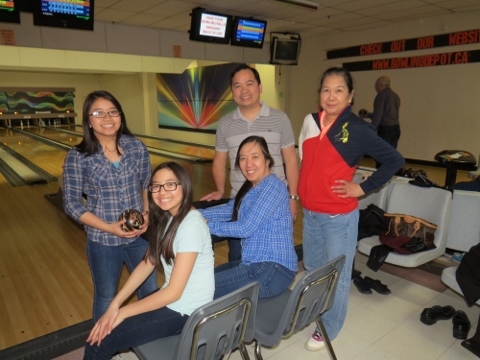 Each year, just prior to the Purina Walk for Dog Guides in May, a fun night of bowling is held to raise awareness and funds for the National Lions Dog Guide program. 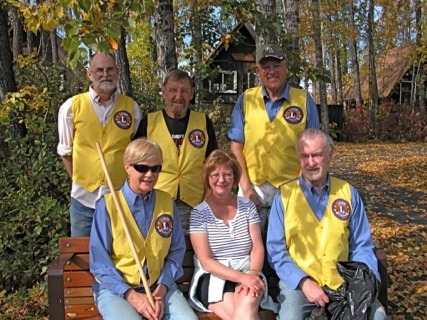 It is organized by Mountainview Lions and in 2014 Lion Betty Ann did another amazing job of getting clubs out to take part and spread the word about the Lions Dog Guides Program. Purina Walk for Dog Guides is a national event held annually by the Lions Foundation of Canada in excess of 180 communities across Canada. In Calgary, Mountainview Lion Colin Graver chairs the committee that oversees this event each year. Held at the end of May in Confederation Park the event raises thousands of dollars for the national Dog Guide program. Usually accompanied by a BBQ provided by a Lion's Club, the morning is an active one with many dogs and their humans enjoying the beautiful park walks. In 2014, the walk raised over $19,000 for the national program. 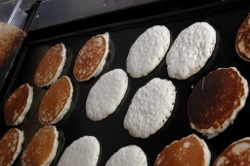 For the past four years, the Mountainview Lions Club members have provided a scrumptuous, off-the-griddle pancake breakfast for all the participants in the Stampede Road Race. Lion Dave Fairless organizes this event each year involving over 20 Lions and friends. The early morning schedule of set up and preparation is gruelling but, in the spirit of Lionism, enthusiasm and hard work abound. In 2014, the race took place on July 6th and, of course, the Mountainview club were in full vigor demonstrating their griddle techniques. This year the Stampede Road Race supported a number of children's charities. The race is held annually at the Glenmore Track in southwest Calgary. On two Sundays each month, Lions Sandra Rowe (left) and Irene Graver (centre) lead the residents of Colonal Belcher Care Facility in a rousing game of Trivia - certainly appreciated by all who participate. The trivia questions and answers are prepared by Lions Colin (right) and Irene and are mainly focused on past events. On the last Tuesday of each month Lions Sandra, Christina, and Irene hold a birthday party, complete with cake, for those celebrating birthdays in that month. These two programs are eagerly looked forward to by the residents at Colonel Belcher and have become an integral part of their monthly activities. Now an annual tradition, Mountainview Lions organize and cook a pancake breakfast and hot lunch for the Twin Arenas Hockey tournament. Held each year at the Crowchild Twin Arenas, the tournament attracts teams from all over Alberta for a weekend of good play and community involvement. Usually held on an April weekend, the club members often have to brave the worst of Calgary weather - snow, sleet, wind, and cold. But none of this can keep the pancakes from flipping or the hamburgers from sizzling. 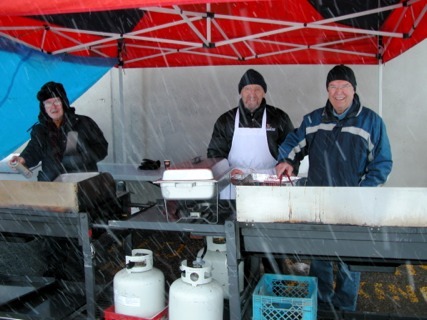 Armed with tents and equipment, the Club member bundle up to serve for over 100 of the hockey tournament participants. Mountainview Lion Tim Clarke first became involved with the Lions Youth Camp in 2006 assisting on workdays helping in camp maintenance and clean-up. Lions Tim has since produced the LYC Health, Safety and Environmental Plans as a working document and to ensure compliance with provincial legislation. 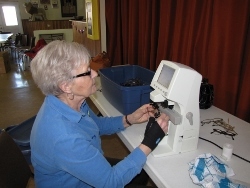 Since that time, Mountainview Club members have regularly contributed many hours to assist in the clean-up and maintenance of the camp located on the banks of Dog Pound Creek in Cremona, Alberta. Mountainview Lion Bill Chennells annually coordinates t he Peace Poster entries from our club. Lion Bill approached a number of Calgary Northwest Junior High Schools and received a very enthusiastic response from H.D. Cartwright School to participate in the Peace Poster program. In 2012-2013 the winner was Cheshta Sharma and her entry placed 2nd in the District. 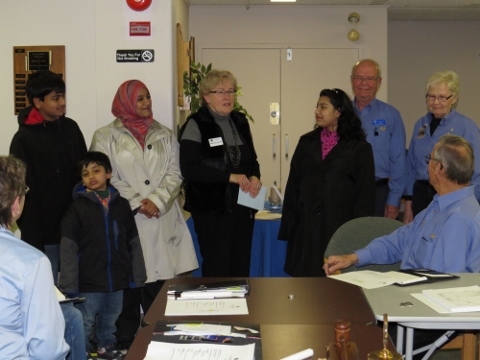 In 2013-2014 the District Winner, sponsored by the Mountainview Club, was Samia Saleem, a grade seven student at H.D. Carwright School. Saleem (4th from right) is seen here with members of her family, Lion Bill Chennells (3rd from right), Lion Joey Hyde Wilson (2nd from right), and Lion Margaret Brucker (centre) Chairperson of the Peace Poster Committee and presenting Saleem with her prize. The CLERC Centre in Calgary is the only one in Canada and has been in operation for the past five years. Collected eyeglasses are cleaned, sterilized, graded, bagged and tagged before being sent to 3rd world countries. 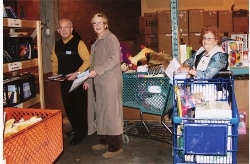 Mountainview Lions regularly volunteer to assist in this process coordinated by Lions Margaret Young and Dave Fairless. On the right, Lion Joey is using the machine that reads the glasses prescription. 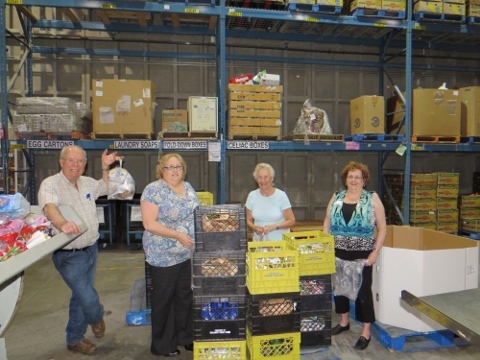 On Tuesday, June 4th, members of Mountainview Lions volunteered their time at the Calgary Food Bank. Lion Bill Chennells organizes this activity for the Club (far left). Small care packages of snacks or hygiene products were made up from donated items. The shifts are 3 hours long with a 15 minute tea/coffee break. The Mountainview club has agreed to do this activity once every three months or as needed. 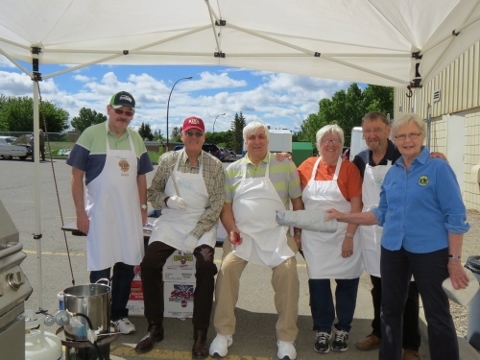 On Sunday, June 16th, 2013, seven members of the Mountainview Lions Club provided a sizzling hamburger and hotdog BBQ as part of the celebratiion of the 50th Anniversay of the Brentwood Community Association in Calgary. More than 500 hungry attendees were served. At the end of the event, not a morsel of food was to be found. A success for all! Each Christmas, the Club goes shopping for gifts for the children of a family selected by the Bowwest Community Resource Centre. The families are usually new to the area and would otherwise not have the resources to provide those special packages for their family on Christmas morning. Members of the club take a "wish list" provided by the family and Bowwest and try to match the wishes of the children as closely as possible. 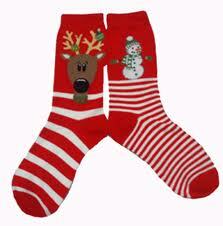 If funds are left over, a gift certificate for groceries is provided to the family. The Calgary Pet Expo takes place each spring and features hundreds of pets, pet products, service providers, entertainers, clubs and organizations catering to pets. 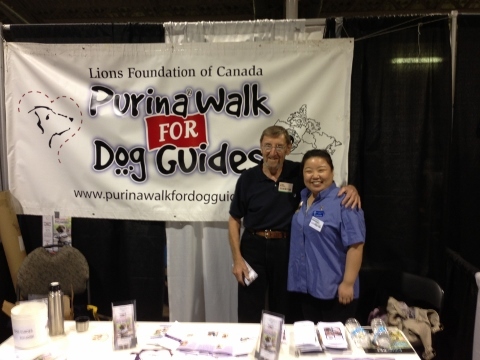 Each year Mountainview Lions take their turn giving out information on Lions and the Purina Walk for Dog Guides. Purina's Walk for Dog Guides takes place every May to raise funds and awareness for the Dog Guide program in Canada. Mountainview Lions John, Joey, Shiny, and Colin participated in this years Pet Expo. Shown in picture are Lions Colin and Shiny.